Attracting nearly 14 million tourists per year, Notre Dame cathedral lies at the heart of French history and culture as a treasure of French Gothic architecture and is a renowned house of worship in the Christian world. The architectural gem is located on the Ile de la Cite — a tiny island in the Seine River in Paris. It hosts five religious services every day and seven on Sundays. 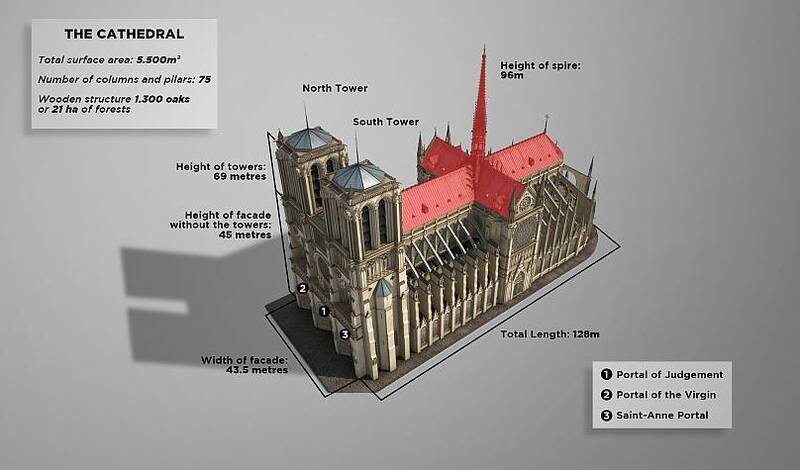 The construction of the emblematic cathedral began at the end of the 12th century and lasted more than two centuries. Since its creation, the gothic structure has lived and breathed important moments of French history. It was in Notre Dame that the infamous French monarch Napoleon Bonaparte crowned himself emperor of France in 1804. The cathedral survived two world wars and it famously rang its gigantic tenor bell when France was freed from Nazi occupation in 1944. Two decades later, it hosted the funeral of the French war hero and president Charles de Gaulle. 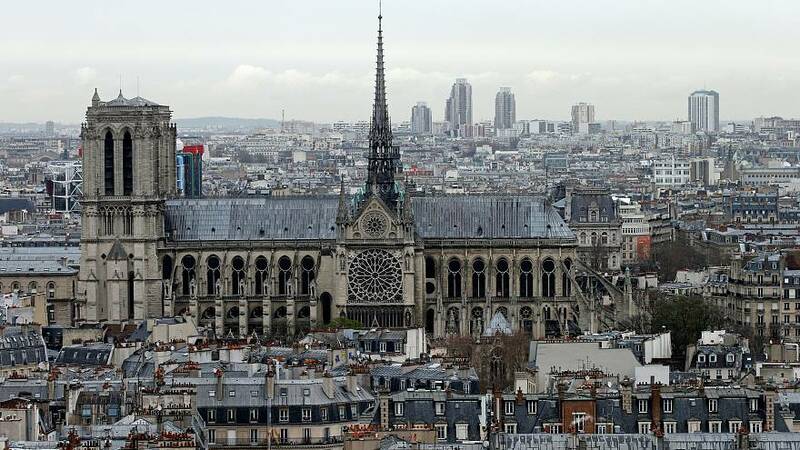 As French author Bernard-Henri Levy described it, Notre Dame is "the France of the Resistance, of Europe, and literature. It's the Gothic holiness and the softness of the Seine. Faith and beauty. Aragon and Hugo. This morning, in the face of the gigantic fire? Hugo said: 'time is the architect but the people are the mason'." 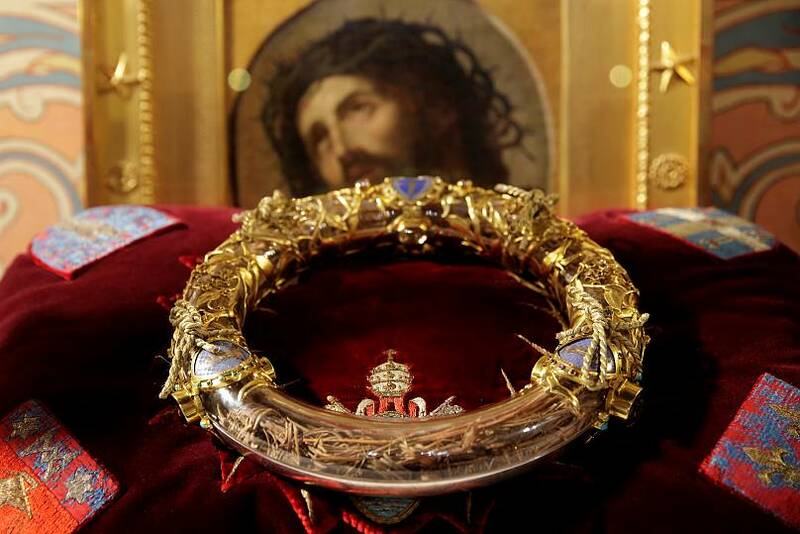 The cathedral was also home to some of the most praised artefacts in Catholicism, such as the crown of thorns believed to have been worn by Jesus before his crucifixion as well as the tunic worn by Saint Louis, a 13th-century king of France (Louis IX). Both of these relics were saved from the fire, said Monsignor Patrick Chauvet. A week ago, sixteen saints were removed from the now-burnt spire as part of a €6 million project to renovate the cathedral. The three-metre-high statues, weighing approximately 150 kilograms, depict the Twelve Apostles and Four Evangelists. Sculpted by Eugene-Emmanuel Viollet-le-Duc, they have crowned the 12th-century cathedral since the 96-metre spire was erected in the middle of the 19th century. The cathedral was also home to the grand organ and various other art masterpieces. In 1831, French author Victor Hugo wrote his timeless piece, The Hunchback of Notre Dame (Notre Dame de Paris) bringing back some energy to the decayed cathedral. His novel rallied support for a restoration project that would bring back the gothic beauty to its natural splendour. The cathedral's central spire was added during the restoration project in the 19th century. The cathedral’s nine giant bells were replaced in 2013 and the spire, which collapsed, was in the process of being renovated. Saddened by the tragic destruction of a French cultural gem, president Emmanuel Macron pledged to reconstruct the cathedral. "It's our history, our literature, our imagination, the place where we experienced all our greatest moments," said an emotional Macron, "we will rebuild Notre-Dame together."